The last decade has seen more changes to the way in which businesses operate than in any period since industrialization. The tools now available in just a few mouse clicks have allowed companies to fundamentally alter working practices, dramatically cut costs and uncover opportunities previously unimagined. Platforms such as Skype, which allow real time video communications, have given businesses the ability to hold regular "face to face" meetings with clients without having to factor in the time and travel costs previously needed to be in the same place. Social media services like Twitter and Facebook allow firms to have a direct and instant voice with clients and customers the world over and, in turn, gain a better understanding of what they want. Crucially, all of the aforementioned examples are completely free and incredibly simple to set up. This is of particular relevance for SMEs who no longer face the financial barriers they previously did when it comes to challenging larger rivals. Like every other aspect of business practice, the payment process has been massively disrupted by technology and all companies need to make sure their current practice reflects this new world order and is not based on models in place before the digital revolution. Traditionally, most SMEs would have had a restricted geographical customer base due to the likelihood of being anchored in one or more physical locations. Trading nationally or internationally required a major investment in logistics and manpower. Selling outside of your geographical reach would involve mobile sales teams, costly advertising and the production of physical catalogues. Payments tended to be made by invoice or check and often through the postal system. This was a time consuming and expensive process for businesses and customers alike. The dawn of the internet age changed all that. Businesses - large or small - are now able to sell online to any market in any location. But setting up an e-commerce shop changes more than just the ability to sell to a larger audience more easily. It can change a company's culture. On the most basic level it allows for instant payment via credit card or bank transfer, lowering the number of checks and invoices needing to be processed. Therefore drastically improving a firm's cash flow and how it manages its payments and plans its accounts. And e-commerce sites don't just change the way payments can be taken. They also provide businesses with vital marketing data about their customers and facilitate the creation of targeted marketing campaigns. Again, technology is the great leveler and the cost of setting up an e-shop and marketing campaign is now so low that all SMEs can consider it. It is no longer the preserve of giant chains and brands. Indeed, the simplicity of setting up an e-commerce site means running a business solely online is now a viable option for sole traders and SMEs. For many the need for a visible physical location for customers and clients has been removed; cutting costs and allowing a reallocation of resources. Just as e-commerce changed the game online for SMEs, so have recent technology developments in hardware. Until recently SMEs wishing to take credit card payments had little option but to use costly payment terminals, usually involving long term rental fees and contracts. This was particularly painful for SMEs who did not want to process payments in large volumes, but perhaps only on an occasional or seasonal basis. 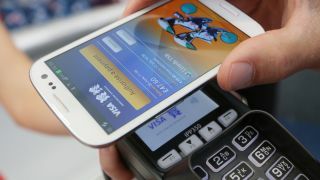 Mobile payments - which allow a vendor to accept payments using their smartphone or tablet - have disrupted this model. Charging a small rate per transaction and eliminating rental fees and contracts, mobile payment services have democratized the payments process and allowed SMEs of any size to take cards. A crucial factor when operating in a society increasingly turning away from cash transactions. As with e-commerce, the benefits extend well beyond the payment process and can fundamentally rework how a business operates. Mobile payment solutions can also provide free analytic tools, which identify customer trends; produce sales reports and help with forecasting. These are benefits that would have traditionally taken a great deal of time and effort to produce and been carried out separately to the actual payments process. Modern, affordable technology has allowed small businesses to adapt and expand their business model to increase both productivity and efficiency. Just as Skype and social media impacted business communication culture, e-commerce and mobile payments systems are offering something revolutionary at an affordable cost. Payments should no longer been seen as a distinct or standalone aspect of a business. It should be seen as an area which can bring in marketing data, enhance customer satisfaction, help with forecasting and cut down on admin. These factors should be fully considered before choosing what platform to adopt. Those businesses that have not or do not change the way they approach the process of taking payments will fall behind. Jens Münch is Managing Director UK at iZettle, a fast-growing payments company whose service consists of a chip-card reader turning smartphones and tablets into mobile card terminals.